Text: Psalms 61:9-62:5 (recto). A scan of the verso is not currently available. effúndite coram illo corda vestra: Deus adjútor noster in aetérnum. Verúmtamen vani fílii hóminum, mendáces fílii hóminum in statéris, ut decípiant ipsi de vanitáte in idípsum. 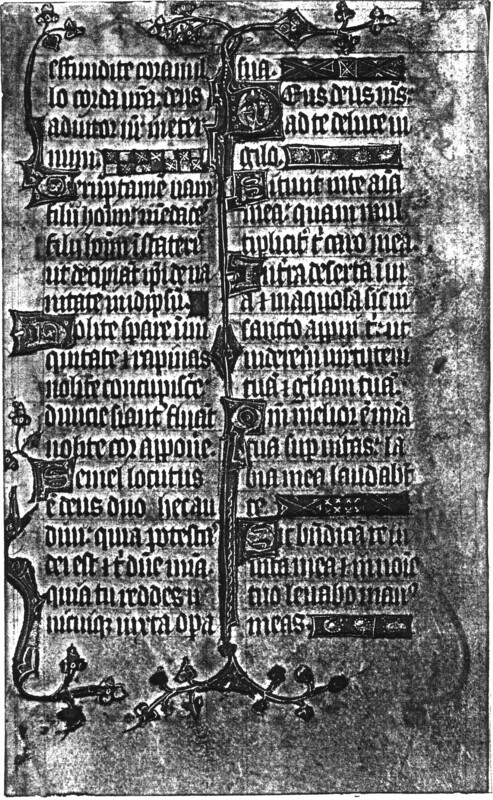 Nolíte speráre in iniquitáte, et rapínas nolíte concupíscere; divítiae si áffluant, nolíte cor appónere. Deus, Deus meus, ad te de luce vígilo. Sitívit in te ánima mea; quam multiplíciter tibi caro mea! In terra desérta, et ínvia, et inaquósa, sic in sancto appárui tibi, ut vidérem virtútem tuam et glóriam tuam. Quóniam mélior est misericórdia tua super vitas, lábia mea laudábunt te. Sic benedícam te in vita mea, et in nómine tuo levábo manus meas. ...pour out your hearts before him. God is our helper for ever. 10 But vain are the sons of men, the sons of men are liars in the balances: that by vanity they may together deceive. 11 Trust not in iniquity, and cover not robberies: if riches abound, set not your heart upon them. 12 God hath spoken once, these two things have I heard, that power belongeth to God, 13 and mercy to thee, O Lord; for thou wilt render to every man according to his works. 2 O God, my God, to thee do I watch at break of day. For thee my soul hath thirsted; for thee my flesh, O how many ways! 3 In a desert land, and where there is no way, and no water: so in the sanctuary have I come before thee, to see thy power and thy glory. 4 For thy mercy is better than lives: thee my lips shall praise. 5 Thus will I bless thee all my life long: and in thy name I will lift up my hands.